Enjoy your indoor and outdoor entertainments with Redcamp aluminum folding table. High Quality & Considerate Details Redcamp adjustable folding tables are constructed of medium density fiberboard and aluminum alloy frame. They will not crack, chip or peel. Security latch help the tabletop keep steady when setup, impact-resistant design of round corner on the tabletop ensures safety, triangle locking hinge add more support to ensure the stability. Adjustable foot caps provide balance even on unflat floor. Easy Carrying Compact and small when folded, with portable handle you can carrying this lightweight aluminum camping table without too much strength. 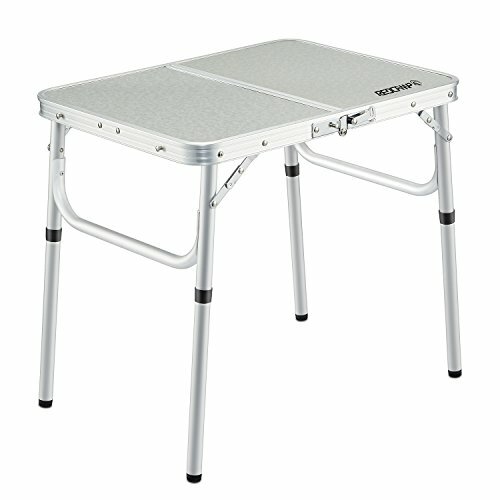 Go anywhere you want at any time with this multi-purpose tables with folding stools Great for all activities 2 height available with detachable legs for different needs. Water-proof, stain-resistant, served as a 4 -season camping table, suitable for picnics, beaches, parties, fishing, camping, hiking, outdoor concerts, & more About REDCAMP REDCAMP is a professional outdoor equipment brand. We adhering to the "Enjoy ur tour, Enjoy ur dream." as the design concept, we design and develop the high quality outdoor gears to provide you a favorite outdoor experiences in the nature. The REDCAMP Character: Higher Quality Customers First Our goal is to provide higher quality products with premium, unique features. All of our gears are thoughtfully designed and tested to exceed your expectation and we love to hear back from our customers about their user experience. Trust us, Trust yourself. TWO ADJUSTABLE HEIGHT: High height-19'', Low height-10.2'', Setup dimension:23.6x15.7x10.2/19in. Folded dimension:15.7x11.8x2.6in. GET THIS PORTABLE TABLE RISK FREE: Your 100% satisfaction has always been our top priority. That's why all our products are backed by unconditional 365-day manufacturer warranty. If you have any questions about this product by REDCAMP, contact us by completing and submitting the form below. If you are looking for a specif part number, please include it with your message.